During a recent visit to Saint Rose to discuss climate change, Judith Enck ’81 asked the Saint Rose students in the audience to stand, then called on the visitors from Siena College and Emma Willard School to do the same. “You guys need to meet after this and talk about what you can do!” Enck, Region 2 administrator of the federal Environmental Protection Agency, said during her visit February 12. “That way, you can help solve this issue in your area. ”While outlining the horrific impact of the planet’s rising temperature – the more-violent storms, widespread flooding, the increase of asthma and other heat-related illnesses – Enck managed to keep it light. 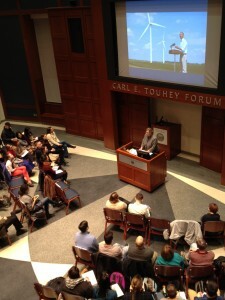 She reminded students and the local environmentalists who filled the Touhey Forum of their ability to help ease the crisis and apprised them of new efforts at the federal level. 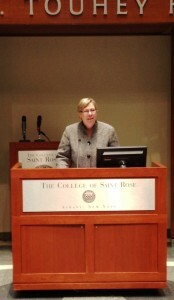 Enck, the guest of the College’s Environmental Club, prepared for her career at Saint Rose, where she earned her degree in history and political science. She started the College recycling program and became active in local and national environmental issues. After grassroots environmental work with the New York Public Interest Research Group, she spent eight years as a policy adviser to the New York State Attorney General and then as deputy secretary for the environment under Gov. David Paterson. In 2009, President Obama appointed Enck to head an EPA region that takes in New York, New Jersey, Puerto Rico, the U.S. Virgin Islands and eight Indian Nations. Among other things her office administers federal programs governing air and water pollution and oversees cleanup of chemical spills and hazardous waste sites. Enck defined climate change as a warming of Earth’s atmosphere caused by the gasses that are trapped by the burning of fossil fuels and by emissions from cars and other vehicles. She noted that 2014 was the hottest year since records have been kept and that a disproportionate number of the hottest yeares on record have come in the past decade. She likened the reaction to climate change to the early skepticism about the ill effects of smoking. Today, she said, there is general agreement among scientists that the planet is warming and that human activity is the cause. To reduce carbon emissions, the EPA has introduced standards that will require cars to get 50 miles per gallon by 2025. Another measure, which calls on states to develop their own plans, should lower emissions by 30 percent. Enck acknowledged that the political momentum is not working in the administration’s favor. In the absence of agreement by Republicans in Congress, President Obama enacted the clean air measures through executive order. Enck fielded energy-saving suggestions from the audience that included turning off lights, unplugging chargers, conducting a home energy audit and switching to solar energy. Enck, who showed a photo of herself at an anti-nuclear rally in Washington in 1979, discussed the importance of getting involved during college. She praised her professors for fostering her activism.